As you may have noticed, I blog significantly less these days. I began this blog in 2010 (what!?) and have been pecking away at it for about 6 years; basically, my blog is an internet dinosaur. For years, my blog has been my memory-keeper. 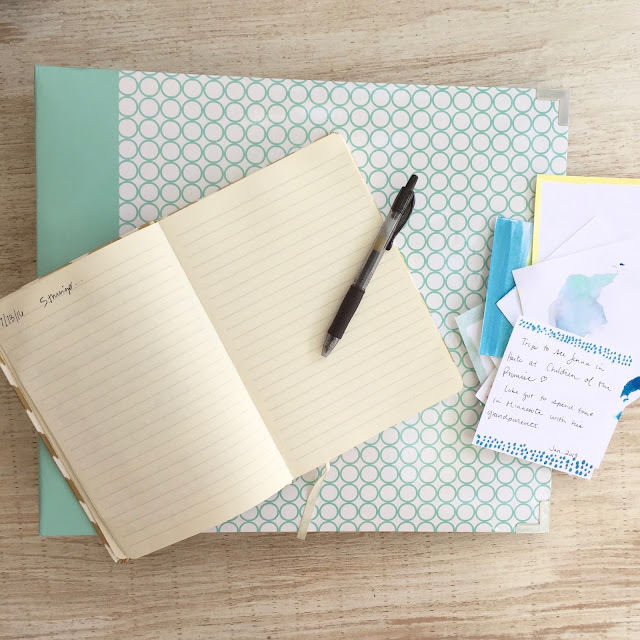 My 775 (yes, 775) blog posts have filed away motherhood thoughts, captured the essence of Luke's early years, and collected favorite recipes and projects. My blog has been the digital journal for hundreds of thoughts, stories, and ideas. It has been the pictures and words of my life. But life is transitioning to a less digital and more tangible season. A season that sorting through pictures while sitting on the floor is easier than having eyes focused on a screen. A season that I want to protect our family by not sharing everything online. A season that simply feels more private. 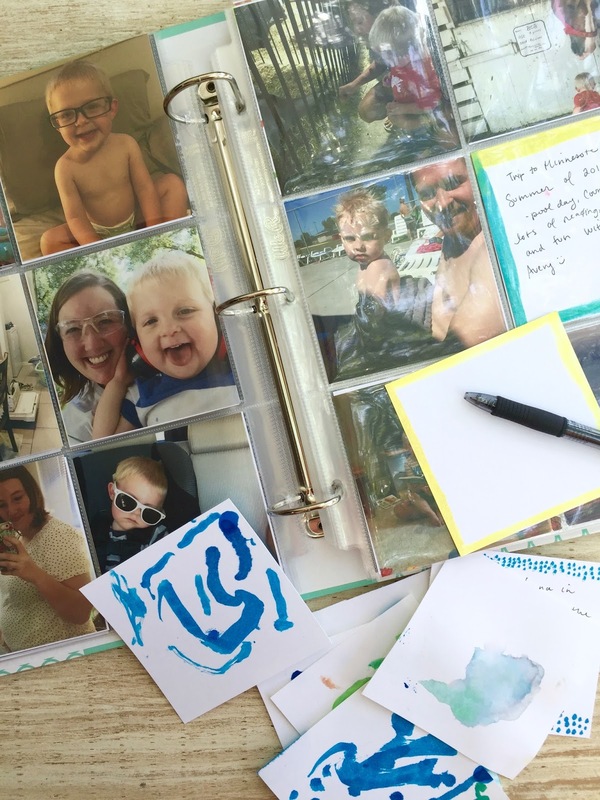 I'm far from saying "adios" to blogging, but I decided to start working in other mediums to collect our family memories. I tried to design a fancy photo book online, but I got so distracted by choosing fonts and lay-outs (even though it was fun!) that I knew it was time to try something else. 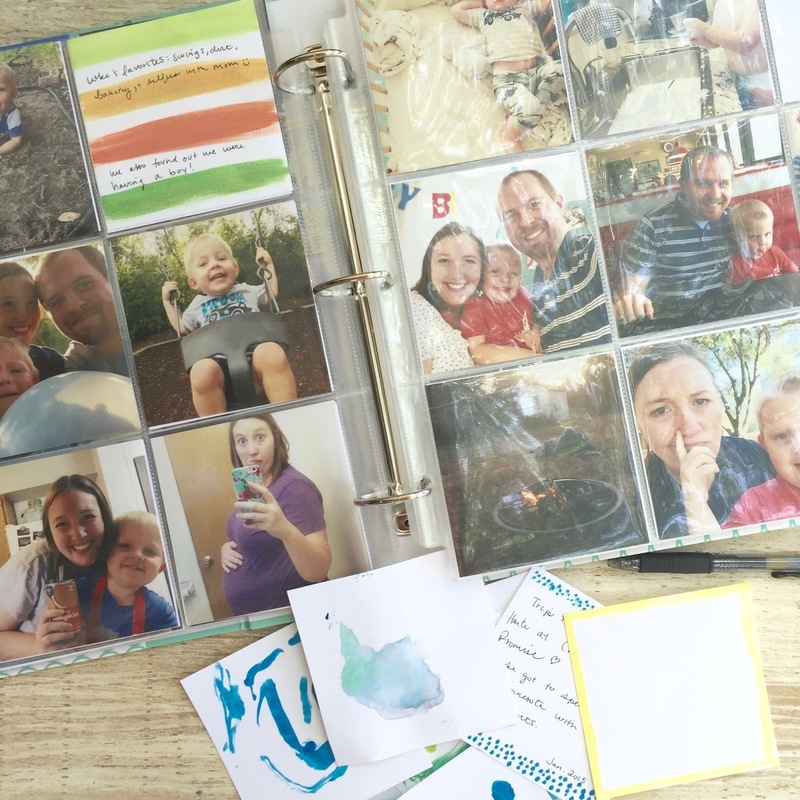 So, I'm preserving memories in two ways that are simple and fuss-free. First, I'm going all 1985 and putting pictures in a picture album. I love that I can take out the pictures, rearrange them, and add little notes to the back just like my mom did. I found a giant 3-ring binder (a honking 12x12 one). The one I found was on clearance at JoAnn's (it's actually a Project Life album), but this is the one I originally planned to buy. Then, I grabbed these 12x12 photo inserts on Amazon and started filling them up. The other day, Luke and I did some simple watercoloring on 4x4 pieces of card stock to use as little inserts for jotting down dates, notes, and memories. I loved how it was an easy way to involve him and add a little artwork to the album. I do plan on adding some 8 1/2 by 11 clear plastic inserts/folders to include Luke's artwork or other mementos. I may also print out some of my past blog posts to add to it as well. 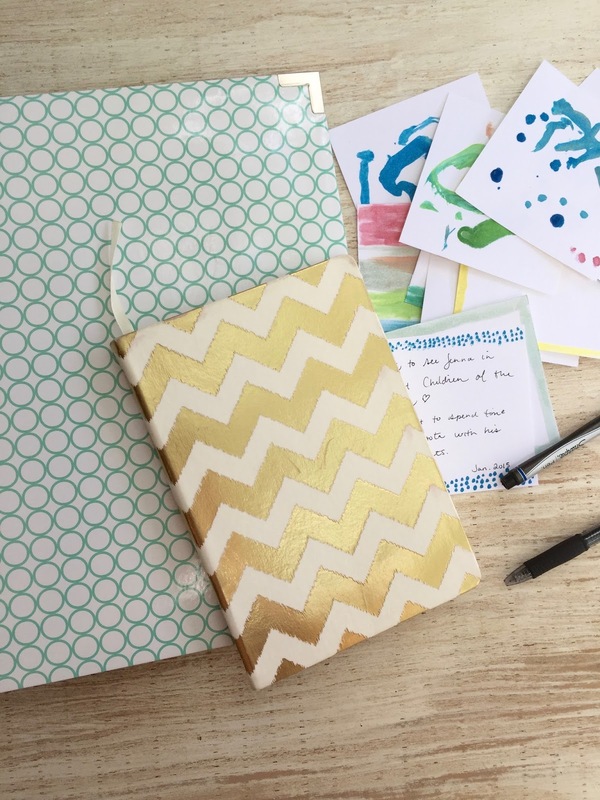 The second thing I am doing is journaling 5 things about everyday. I take a little time at the end of the day (usually about 5 minutes) to write in a simple, lined journal. I don't have any set guidelines--but I try and think of details, moments, feelings, etc that made that day unique. I've written about milestones, hair cuts, Luke's sayings, frustrations, things I'm thankful for, observations, etc. 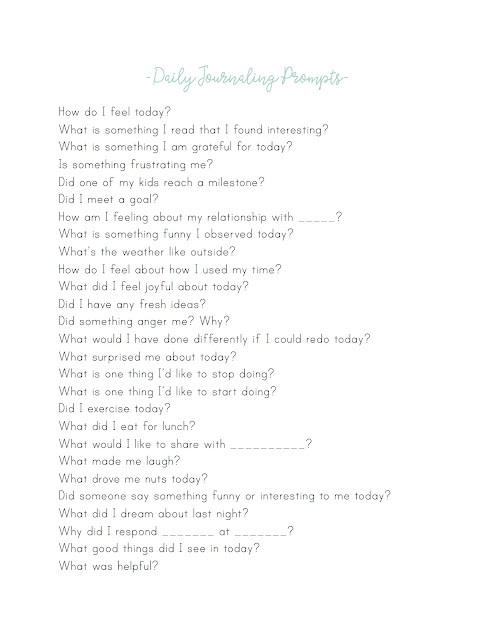 I also jotted down a list of prompts because sometimes as a mom my brain is mush at the end of the day and I need some prompts to encourage me to write more than: The kids took naps or What did I do today? If you are interested in trying out this kind of journaling, you can download the prompts here. It doesn't replace a good, process-it-all-out blog post/writing, and it's certainly not as fancy as a cool bullet journal, but it works. Right now, it's a manageable way for me to keep writing and stockpiling memories and thoughts. What about you? How do you preserve and record memories? I have been wanting to do this for so long!! I just feel so sad about every day that goes by because I know I will forget the day to day cute or silly or annoying ;) things my kids do. Thanks for the motivation! I know that simple pen and paper is what I need to do to keep up with it. Your photo album is great! I've enjoyed reading your blog over the years and I do read every post but I often don't take the time to comment. Just know that many, many, of the things you post resonate with me! Good luck with your memory-keeping and thanks for the fun prompts.